It’s always so exciting to get a new book cover. Every publisher is different, but with Harlequin category books, the cover really is a complete surprise. Authors aren’t sent a rough draft to critique. So the moment I click on the link to my new cover is always a pulse-accelerating combination of excitement and worry. Because… what if I hate it? I haven’t ever hated my book covers, just to be clear, but there are a few I’ve loved less than others. But this cover was love at first sight. Because this is exactly how I’d pictured Arch Hoffman, the hero of my November 2016 book, Home Free. I have no idea what went so right this time. Like always, I sent the art department photos of what my hero looks like. In the past, my book covers haven’t always reflected those images. But this time? Boom! They absolutely nailed it! And it makes me even more excited to share this story with readers! I so hope that you enjoy Arch’s story. 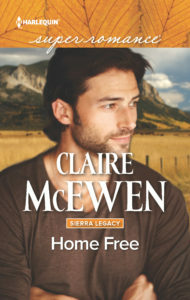 Home Free will be available at Harlequin.com in October and everywhere else in November. Until then, please enjoy the beautiful cover! ← When You’re Stuck, Jump Around!